Back in the ‘90s, author Evelyn Palfrey started a new thing. She wrote romance stories with lead characters who were “marvelously mature;” a term she crafted to describe her sheros and heros–adults in their fifties and sixties; some retired, some not; some with children who were “grown and gone,” some who were raising grandchildren, but all confronting love in their latter years, which made for plots that were unfathomable in the more traditional romance stories. I read every one of Evelyn’s books and enjoyed them thoroughly. This spring when I learned she had a new release, I jumped online and downloaded my copy of Going Home. Like her other books, I devoured each page and when I reached the end, I was not happy about saying good-bye to the characters. I don’t write and post book reviews on every book I read but this one – yes. Because I want readers to learn about and read Evelyn’s works (if they haven’t already). And as we all know, in this cyber literary world, book reviews are important. My brief comments about Going Home follow and if you want more information about Evelyn or her other works, click here. Going Home is a contemporary romance story set in Austin, Texas. 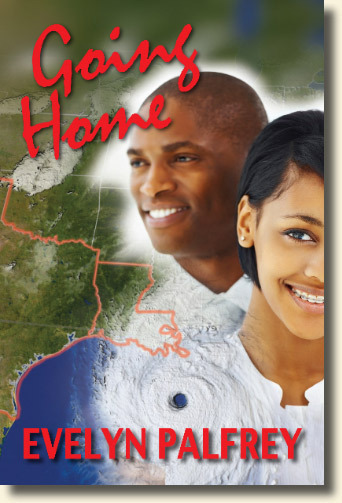 The heroine, retired office worker, Thalia Allen specializes in taking in orphans—her granddaughter Mishay and a father/son combo, Joe Lambert and Kyobe, who ended up in Austin after Hurricane Katrina ran them out of New Orleans. The story opens with a snapshot of Thalia and Mishay in their routine home/school/church/life activities; a routine that quickly alters when Thalia allows Joe and Kyobe to move into her home. Thus starts a slow, respectful buildup to romance and love between the adults while the two teenagers struggle with their own teenage issues: school work, peer pressure, cliques, dating, violence, college, etc. Encapsulating all four story lines is the natural evolution into a family unit; an outcome that makes them all emotionally stronger, secure and happy. Just as the family is strengthening and everyone is settling into their natural place, Joe blows the family apart with an announcement: he is returning to New Orleans to resume his life there. It’s a heartbreaker for Kyobe and Mishay, but especially for Thalia who has given Joe her heart and has come to rely on him. Joe moves back home and is in New Orleans for several months before he comes to the realization that his life, his happiness, his heart is not in New Orleans, but in Austin. Acknowledging this, he returns to Austin to immediate acceptance by everyone except Thalia. She maintains a hard line with him until he proves he’s there for good by asking her to be his wife. They reunite, the family reunites, and they all live forever in love. Like most romance stories, this is not action-driven but character-driven. We see a satisfying arch of the major characters, including the teenagers. By the end of the story they are more expansive, changed and for the better. The storyline follows a logical line of progression with plot twists in appropriate places, valid emotional ups and downs, and realistic behavior. The settings and descriptions enhance the story and the pacing is appropriate for a romance story. Of course the ending worked. It is after all a romance and the boy always gets the girl. A plus I think readers will enjoy is the cast of characters. There was enough diversity—from thievin’ thug to sassy, low self-esteem teen to independent contractor to retiree—to make me wonder how Thalia was going to make a family of this rag-tag bunch. I should have known love conquers all. The one hole in the story was the missing conversation between grandmother and granddaughter regarding her sexual status after being on the road with a hormone-driven young male. I also did not care for so many church scenes but that’s just me and my personal reading preference. I believe readers will enjoy this story. It is an intelligent read that can easily jump off fiction pages to represent real life.